Revision Rhinoplasty often requires advanced techniques including cartilage grafting. Watch Doctor Jacono on CBS as they chronicle one of his patient’s revision rhinoplasty surgery journey. 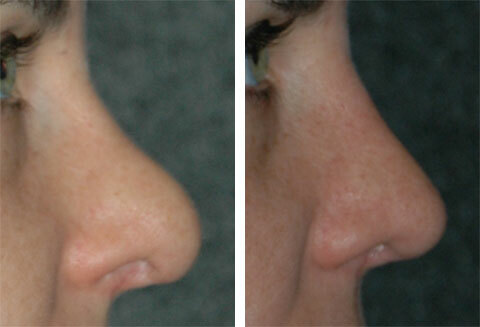 Revision rhinoplasty is a very specialized area in the field of Plastic Surgery. It corrects the inferior results of what is often considered the most difficult procedure in cosmetic surgery: rhinoplasty. 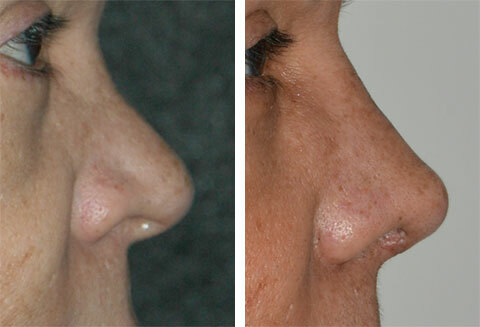 When performing revision rhinoplasty, Doctor Jacono thinks it is important to address not only the aesthetic issues or the way the nose looks, but also the functional issue of breathing problems, all the while being sensitive to the emotional concerns of patient who has been “traumatized” by one or more previously undesirable results. 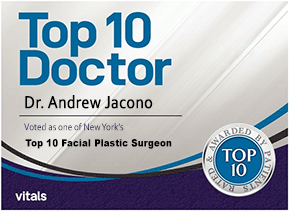 This is why patients from around the world have traveled to have surgery with Doctor Jacono, is one of the best revision rhinoplasty surgeon in New York. He is a revision rhinoplasty specialist. His background and specialty in Facial Plastic Surgery and Facial Reconstructive Surgery make him uniquely qualified for this specialty. 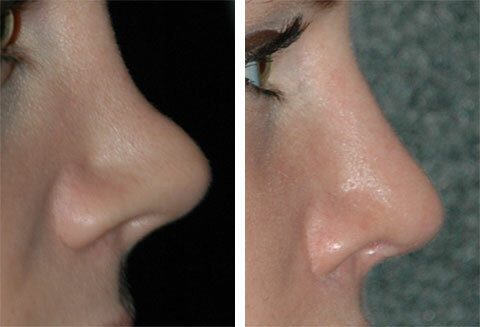 Many times, revision rhinoplasty requires a nose to be reduced in size. Common problems include a nasal hump being left behind (bump on the bridge called a pollybeak deformity), a tip remains wide and lacks definition, a tip is still droopy, or the nostrils are too wide. 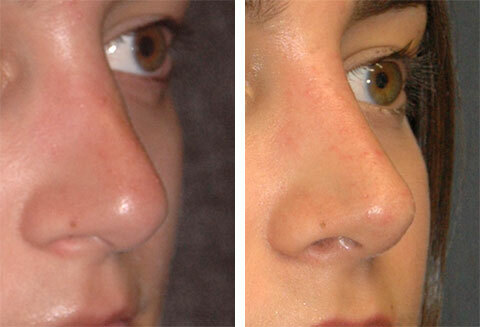 Because the problems are different for each patient, the revision rhinoplasty surgery needs to be customized to each individual’s unique problems. The maneuvers necessary may be as simple as removing some more cartilage or bone, or reshaping the cartilages of the nose. 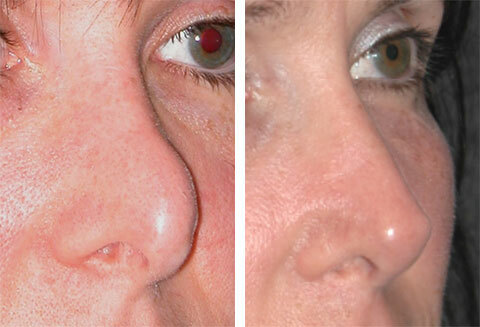 Other times the nose needs to be restructured by adding cartilage support and grafts; if too much cartilage is removed with a revision rhinoplasty the nose will collapse. 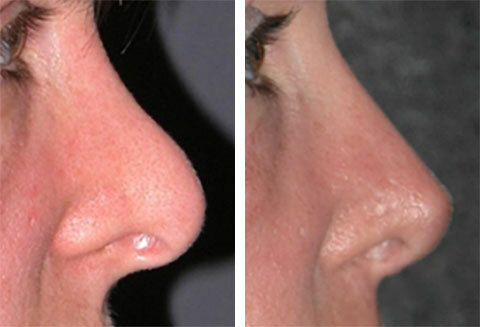 Performing cartilage grafting is necessary when the results of a rhinoplasty give an unnatural “pinched tip”, “pig nose” or an collapsed middle bridge called an inverted V deformity. 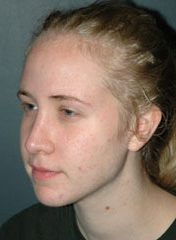 Revision Rhinoplasty Patient 1: This patient had a prior rhinoplasty elsewhere with another plastic surgeon leaving her with a bump on the lower bridge called a pollybeak deformity, droopy tip, and a wide tip without definition. 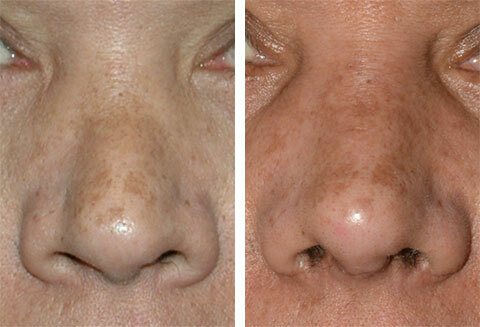 Doctor Jacono performed a revision rhinoplasty with an alar base reduction to correct these issues. Doctor Jacono specializes in revision rhinoplasty, using your own body’s cartilage and bone for restructuring the nose instead of synthetic implants. To restructure the nose in revision rhinoplasty surgery, Doctor Jacono prefers to use your body’s natural cartilage instead of implants (such as silicone, Gore-Tex or Medpore) as foreign substances have a tendency to become infected or are pushed out of the nose (extruded). This can happen as early as the first few months after surgery, other times implants become infected years following surgery. Revision Rhinoplasty Patient 2: This patient had a prior rhinoplasty elsewhere with another plastic surgeon leaving her with a bump on the lower bridge called a pollybeak deformity, droopy tip, and a pinched collapsed nasal tip. 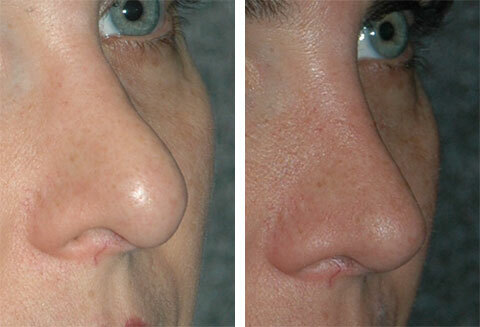 Doctor Jacono performed a revision rhinoplasty which required cartilage grafting from her nasal septum and ears. 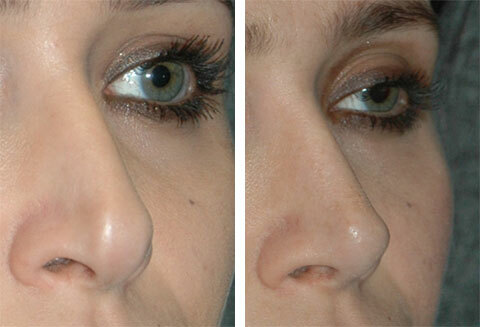 Revision rhinoplasty can be performed through an “open” or “closed” approach, with the “open” approach requiring a small incision across the base of the nose. Some surgeons only perform all rhinoplasty “open” and some perform all “closed.” Doctor Jacono performs Rhinoplasty “open” and “closed”, and chooses the approach depending upon the goals of the revision surgery. Revision Rhinoplasty Patient 3: This patient had a prior rhinoplasty elsewhere with another plastic surgeon leaving her with an over projected tip with the cartilage grafts the other doctor placed forcing their way through the skin. Doctor Jacono performed a revision rhinoplasty, revised the cartilage grafts, and had to use a fascia graft from the scalp called a temporalis fascia graft to thicken the skin. 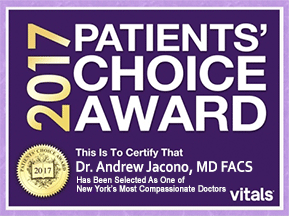 Doctor Jacono and his staff are committed to helping patients overcome their fears of considering yet another nasal operation. 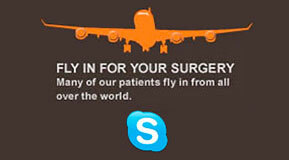 Many of our patients are reluctant to consider further surgery. We applaud your courage to research revision rhinoplasty on our website and invite you to come in to explore how we can make a difference. Revision Rhinoplasty Patient 4: This patient had a prior rhinoplasty elsewhere with another plastic surgeon leaving him with an asymmetric and pinched nasal tip. 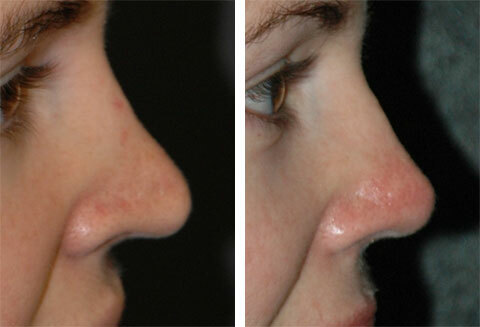 Doctor Jacono performed a revision rhinoplasty which required cartilage grafting from his nasal septum and ears. Revision Rhinoplasty Patient 5: This patient had a prior rhinoplasty elsewhere with another plastic surgeon leaving her with a bump on the lower bridge called a pollybeak, and a nasal tip that lacks refinement. 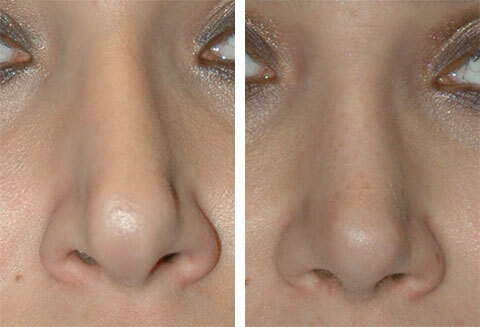 Doctor Jacono performed a revision rhinoplasty to reshape the bridge and tip. 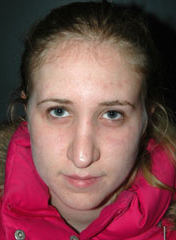 Closed Revision Rhinoplasty Patient 6: This patient had a prior rhinoplasty with another surgeon and has a pollybeak deformity and hump of the inferior nasal bridge and droopy nasal tip. Doctor Jacono lifted and refined the tip and created a smooth bridge. 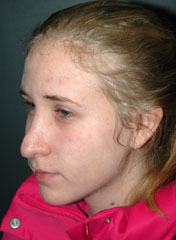 Revision Rhinoplasty Surgery Columellar Show, Nostril Retraction Patient 7: This patient had prior rhinoplasty with another surgeon. 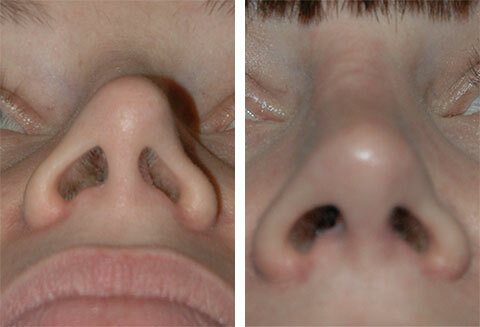 She had alar retraction (nostril margin lifted) and a hanging columella. 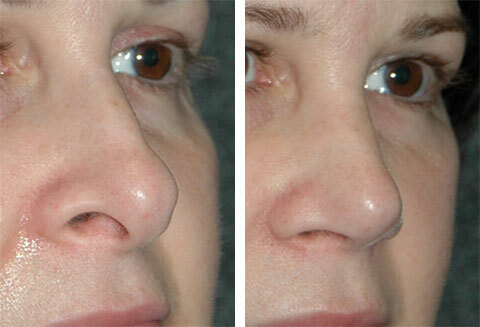 Dr Jacono lifted the columella, balanced the tip and performed rim grafts to reduce the size of the nostrils. An alar base reduction was also done. 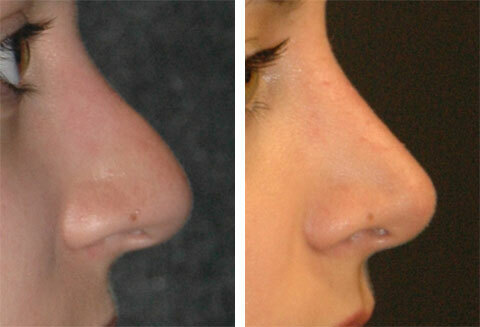 Revision Rhinoplasty Before & After Patient 8: This patient had prior rhinoplasty with another surgeon and had been left with an over projected tip and an over reduced bridge that looked like a ski slope. 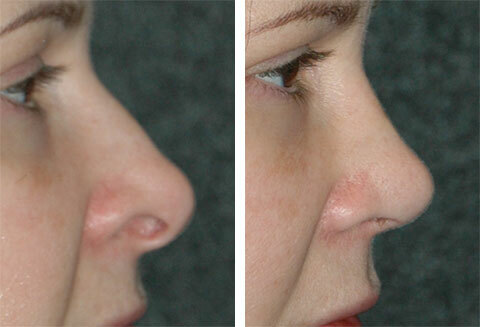 Dr. Jacono performed an open rhinoplasty, deprojected and refined the tip and performed a cartilage graft to the bridge. Revision Rhinoplasty with Ear Cartilage Graft Pinched Tip Patient 9: This patient had rhinoplasty with another surgeon and had nasal tip collapse and a pinched nasal tip. 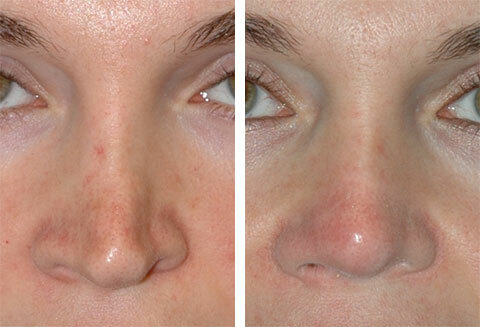 Dr. Jacono performed an open rhinoplasty with ear cartilage graft to the tip. 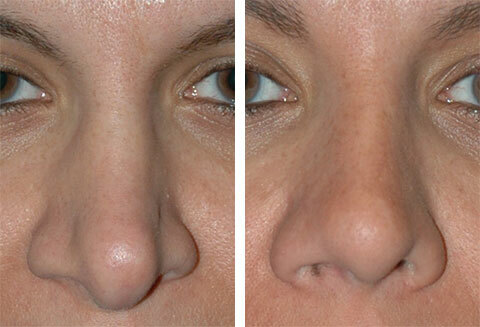 Revision Rhinoplasty Tip Before and After Patient 10: This patient had a prior rhinoplasty with another surgeon and has a distorted nasal tip with asymmetry, hanging columella and wide nostrils. 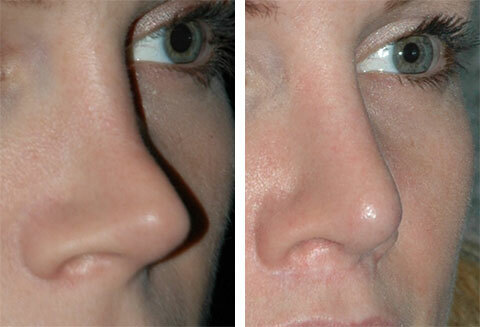 Dr. Jacono performed a revision open rhinoplasty, created symmetry and balance with advanced tip shaping techniques, and reduced the nostrils with an alar base reduction. Revision Rhinoplasty with Inverted V Deformity and Collapse of Nasal Bridge Patient 11: This patient had a rhinoplasty surgery with another surgeon and has a collapse of her middle nasal bridge creating an inverted V deformity or depression of the center of the nose. Dr. Jacono used ear cartilage grafts to balance the bridge and refined the tip giving the nose better aesthetic balance. 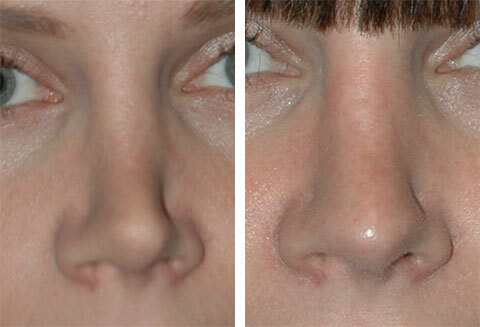 Revision Rhinoplasty Nasal Tip Grafting Patient 12: This patient had a prior rhinoplasty with another surgeon and had an under projected nasal tip. Dr. Jacono performed a revision rhinoplasty with an extended tip graft to increase projection and an alar base reduction to balance the nostrils. 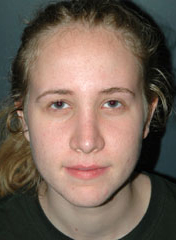 Revision Rhinoplasty Collapsed Nasal Tip and Drooping Nasal Tip Patient 13: This patient had a prior rhinoplasty with another surgeon that resulted in collapse of the nasal tip cartilage and nasal tip pinching. Dr. Jacono performed tip cartilage grafting using septal cartilage, lifted the nasal tip, and reduced the nostril flaring with an alar base reduction. Revision Rhinoplasty Pollybeak Deformity Patient 14: This patient had a rhinoplasty with another surgeon and had too much of the inferior nasal bridge leaving a “parrot like” nose with a droopy tip and columella. 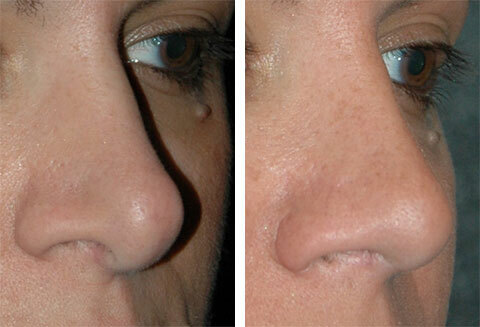 Doctor Jacono balanced the tip and created a more natural feminine bridge and rotated tip.